“New and used from $0.01” !!! And get your local bookstore to obtain several copies for others! "A compelling cautionary tale that deserves to be read by architects, public administrators, elect- ed officials, and humble citizens who care to understand what is at stake when irresponsible power is permitted to design the world to its liking." "Eric Darton's [Divided We Stand] is a model not only of writing but of citizenship. It fuses analytical brilliance with personal feeling. Eric knows and shows where the bodies are buried, but he never lets his anger poison his underlying love. He shows us how to confront all that has been done to our town, and how to live through it and lay claim to the city as our own." 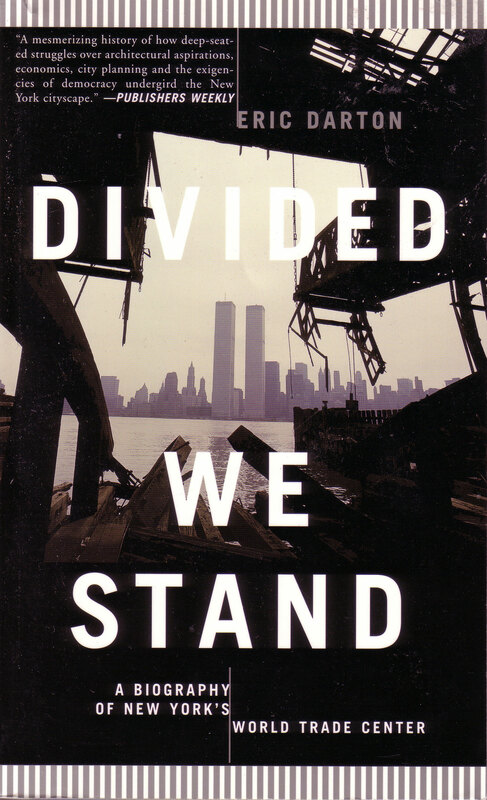 "Divided We Stand... is an engaging book, and often beautifully written, intercutting vignettes of local history with a chronicle of the political, ideological and financial tides that once swept through the city, leaving the Trade Center in their wake." "More than an eloquent meditation on one of New York's most recognizable architectural markers, Eric Darton's Divided We Stand pops with luminous insights into the social, economic and cultural contradictions of a city and a time. A must read." - STUART EWEN, author of PR! 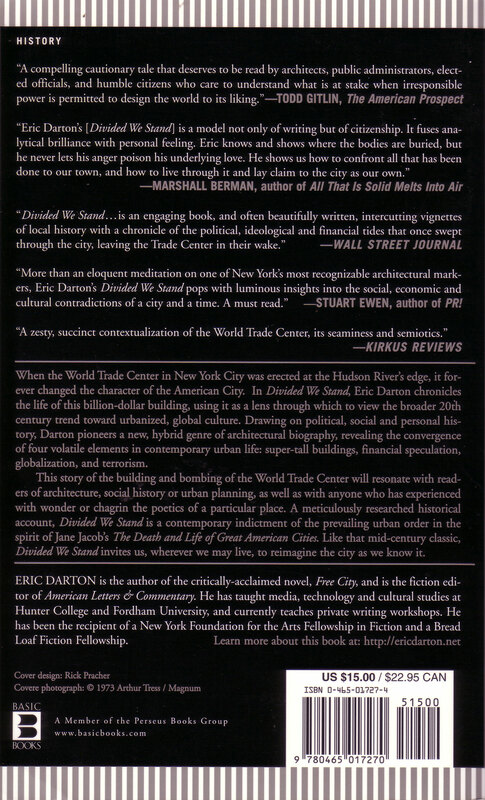 "A zesty, succinct contextualization of the World Trade Center, its seaminess and semiotics." When the World Trade Center in New York City was erected at the Hudson River’s edge, it forever changed the character of the American City. In “Divided We Stand,” Eric Darton chronicles the life of this billion-dollar building, using it as a lens through which to view the broader 20th century trend toward urbanized, global culture. Drawing on political, social, and personal history, Darton pioneers a new, hybrid genre of architectural biography, revealing the convergence of four volatile elements in contemporary urban life: super-tall buildings, financial speculation, globalization, and terrorism. This story of the building and bombing of the World Trade Center will resonate with readers of architecture, social history or urban planning, as well as with anyone who has experienced with wonder or chagrin the poetics of a particular place. A meticulously researched historical account, “Divided We Stand” is a contemporary indictment of the prevailing urban order in the spirit of Jane Jacob’s “The Death and Life of Great American Cities.” Like that mid-century classic, “Divided We Stand” invites us, wherever we may live, to reimagine the city as we know it. ERIC DARTON is the author of the critically-acclaimed novel, Free City, and is the fiction editor of American Letters & Commentary. He has taught media, technology and cultural studies at Hunter College and Fordham University, and currently teaches private writing workshops. He has been the recipient of a New York Foundation for the Arts Fellowship in Fiction and a Bread Loaf Fiction Fellowship. This book began quite unintentionally in 1992 as a research paper written for a seminar on mass media and contemporary culture taught by Stuart Ewen at the City University of New York Graduate Center. Later, as my thesis adviser in the Hunter College Department of Media Studies, Professor Ewen provided intellectual generosity, moral support, and methodological guidance that helped advance the project to the point where it became possible to conceive of it as a book. Serafina Bathrick, then chair of the Hunter Media Studies Department, insisted with convincing firmness-in her dual capacities as mentor and friend-that I pursue the expansion of this work into its current form. I also owe a great debt to Alane Salierno Mason, whose critical feedback cleared away much debris and raised the narrative's key elements into higher relief. Christina Spellman contributed generously of her expertise and erudition. It was through her that I met Wolfgang Schivelbusch, whose lucid reckonings of politics and culture provided a historical matrix for the towers so tantalizingly visible through his windows. Throughout a research and writing process whose elapsed time exceeded that of the trade towers' construction, Joe MacDowell served as a one-person urban bibliography, architectural consultant, and literary critic. Frazier Russell earned my permanent gratitude for his rock-steady and often-expressed belief that this book would eventually make a place for itself in the world. He also introduced me to the work of John Sanford, whose unflinching prose in the cause of historical rescue became my unattainable standard. Bill Gubbins kept my spirits up, urging me on with well-timed bursts of affirmation. Through their heroic feats of language, my writing students lent me the heart to press on with revisions. Elizabeth Kandall made it possible to imagine inhabiting the unimaginable space of the trade center's basement and the dark cellars of this text. Wilma Kehrig fed my efforts at her dining room table, and Elva Kehrig sustained them with her financial generosity. If a book can be seen as a building, Paul Farhi provided the bedrock in which this one is moored. Two cafes, Patisserie Lanciani, formerly on West 4th Street between Bank and 11th Streets, and Le Gamin, at the corner of 21st Street and 9th Avenue, provided hassle-free work space and several fortuitous chance encounters that vastly enriched this story. Distinguished faculty members of these "penny universities" included Bettina Carbonell, B. J. Jaffe, Sam Livingston, Marilyn DeLeo, and Walter Vatter. Jenny Dixon, Richard Dandrea, Ethel Jaffe, Stanley Geller, Joseph Berridge, and Sidney Frigand, all direct participants in the extended World Trade Center drama, contributed generously of their time and personal narrations. Gary Gatza, Kiersta Fricke, George Agudow, Paul Elie, Bronwyn Mills, Michael Florescu, Elena Alexander, and Eric Borrer lent crucial support. Jay Kaplan, editor of Culturefront, and Marisa Bartolucci and David Brown of Metropolis caused extracts of earlier drafts of this book to appear in print. Bettina Schrewe helped guide it to its publisher. To Gloria Loomis, the Demeter of literary agents, much gratitude is due. Her assistants, especially Katherine Fausset, did wonders for my sense of well-being. John Donatich, my editor at Basic Books, re mained dedicated to the spirit in which this biography is told. Consequently, his interventions remain transparent, yet the text is everywhere marked with testaments to his fine ear for language and his eye for structure and detail. Thanks are also due to his assistant, Caroline Sparrow, for engagement and enthusiasm above and beyond the call. I will never run out of gratitude toward my wife and companera, Katie Kehrig, and our daughter Gwendolyn Helena Kehrig-Darton, whose presences made this book's odyssey a joyous game, well worth the candle. Credit is the vital air of the system of modern commerce. than all the mines of the world. stead, he diverted his examiner onto the subject of commercial credit. rower, Morgan replied that "the first thing is character." "Before money or property?" Untermeyer asked. could not get money from me on all the bonds in Christendom." whose topmost peak has been sculpted into a bank. hattan's most valuable parcels of real estate. works-in-progress, among them the George Washington Bridge. Jersey will honor the PA's debt obligations in the event of a default. carry forward their interests as "the best interests of all." only with journalists who consider it a privilege to be in your presence. Nelson, ranging along a continuum from excoriating to sycophantic. for a dialogue with a shadow figure. perilous trip to the summit and the "splendid view of New York harbor"
banker run. "Many people do things because they can't avoid it,"
Meyer said. "David does them out of sincerity." to love humanity. David just likes people." this extract from an unedited 1993 promotional video. people living together in harmony. jecting a set of long-term objectives into a wide range of scenarios. other, denying them any material they might use to forge a united front. ings out of a natural farce-your acts as "manifest destiny." eling his heavy artillery at a sitting duck. while prejustifying the coming surrogate port. masaki designed, the architect's goal of creating a zone of "rational"
not a single building worth saving" among its "tiny, irregular blocks,"
of buildings, it will be inviting, friendly and humane. cally billed as Hope VI. of his design, since "social ills can't be cured by nice buildings." power at the level of an aesthetic relationship. treme repetition," redolent with crypto-fascist "persuasive power." can be coerced they first have to be hypnotized and then bored. gether in the same catchall category. mock funeral processions-featuring the black-shrouded coffin of "Mr.
feller throughout his 1964 presidential campaign bid. Jobs"; Sign Up and Save Radio Row." relations committee, the Downtown West Businessmen's Association,"
imported from 60 countries, including your own." buing the modern office tower with the aura of venerable tradition. opers, consumed wattage for a city of a hundred thousand. housing, and [low] construction and land cost," as reasons for its move. the Times sniped: "GTE Lost!" action to the bombings, Nelson Rockefeller "indicated surprise." visible, supremely external of structures will probably be from within. are framed in our rearview mirror. exposed to natural light, open air, or the play of the elements. earth, narrowed to corridors, and paved over at the height of the first floor. busier's exhortation to kill the street, had settled for burying it alive. anates from what have become, in effect, a set of immense panpipes. ideal and a structural actuality. lyn like a luminescent UFO. control bunker from which he will run the city in case of armageddon. $85 million to keep its five thousand employees in New York. old only brings us into the lobby of a flashy, overdecorated hotel. sold to Marriott for $141.5 million in January 1996.
surrealism to the dining experience. blocks left downtown. Harry Manolakos owned Papoo's in the 1970s. his friends in the summer off the Staten Island Ferry slips. effluvia into the Hudson-well, that would be lunacy. with the salubrity of the area's coastal waters. dropped by half, while maintenance costs doubled. marooned in a sea of flashy detailing. the seven fatalities-that the memorial is not a Dumpster. real estate asset that, by rights, it should not own? claim to a public purpose so deeply. and entrenching its perennially bloated and ineffective bureaucracies. made it "difficult on the numbers to sell the entire property." what the alliance slogan called "The World's Downtown." cial rent tax exemptions, and "up to 47% energy rate reductions." real estate] ... that have traditionally made the Wall Street area home"
and to "figure out a strategy to attract those industries down here." sic World, and other homegrown retail discounters. playful skyline logo design, forming the double "1" in "Alliance." linked to the huge office buildings he had overseen since 1990.